I recently had someone ask me what I do when I travel with diabetes. I have been travelling for a long time now with diabetes to the point where I could probably pack my bags in my sleep. 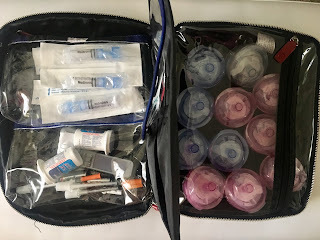 I thought it might be helpful to give a quick overview of what I am packing when I head out on a trip and what I do whenever I am about the embark to somewhere new - well basically to somewhere that doesn't have my over flowing diabetes drawers and local pharmacy near by. The first thing is carrying my supplies. Diabetes supplies make up about 25% of my checked luggage (if I am taking a plane) and about 50% of my carry-on luggage. Depending on where I am going which translates to - if I think I would be in absolute sh*t if I ran out of diabetes supplies. Basically, that will be the deciding factor on how much I decide to divide up my supplies between carry-on vs. checked. Diabetes conference is on the low scale, middle of nowhere trip where english is not the first language and no one else will have diabetes in my travel group - you bet I am bringing a good chunk of supplies in my carry-on. 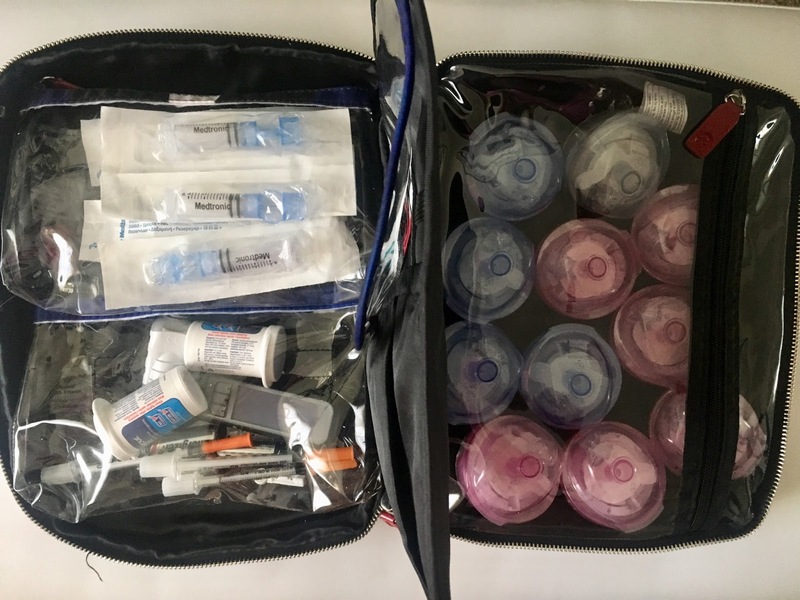 I carry most of my diabetes supplies in one big zippered case that has little compartments. This helps me keep it organized and also helps me check the inventory of the bag. Basically, this bag is always packed and I just refill after trips. I travel quite often so it works out well. When I travel I almost always bring a loaner pump from Medtronic. The loaner pump is just a pump you loan from Medtronic (that was probably obvious!) and you just return it upon coming back from your trip. It is more of a safety blanket than anything. This is a free program, but don't lose it because then it becomes not-so-free. Keep it in a safe when you arrive to your location or somewhere you see fit - basically do not keep it on the bed side table. Insulin, oh insulin. This was the question I got in regards to travelling with diabetes. Where do I keep my insulin and how to I keep it cool. I want to take a hot second to remind you that this is what I do, and whatever you do - make sure you're comfortable with that and maybe ask a health professional if you're not sure/don't trust me. Personally, when I first started travelling I was freaked out about the idea of having to carry medication that needed to keep cool. It was like having to take care of an egg on vacation with specific rules not to break its shell. I was nervous that it wouldn't stay cool, it would break, it would get lost, or someone would steal it. That fear has drifted away, whether for the good, bad or possibly ugly. I have become very relaxed with carrying insulin and honestly each trip is different. Sometimes I keep it in a little bag with an ice pack, sometimes I bring it in a Frio Bag and sometimes I just let it hang out in my backpack for the entire trip (this is what I recently did in Ireland). The good news about this is that every method has worked fine. I have been perfectly okay using the insulin, and nothing bad has happened - fingers crossed. When it comes down to it, travelling with diabetes could look different for everyone. I am sure there are some of us that fear the worst and pack for the apocalypse and then there are others that pack like a teenager packs their lunch. There isn't a right or wrong, or best or worst. There is what works for the individual traveller. that is a dream traveling bag! Any link I could purchase? I purchased this from Target a few years back. It is supposed to be for makeup/beauty supplies. I would check any department store for travel make-up bags - you may find something similar. It makes for a perfect diabetes-travel bag!